Above: Mrs Stuart (centre) during a sacred sites tour for visiting artists and local students; Ntaripe (Heavitree Gap) in the background. 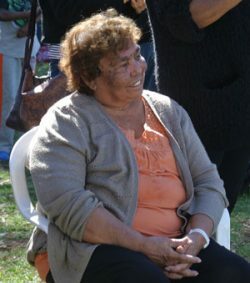 Arrernte custodian Doris Kngwarraye Stuart, well known for her vigilant promotion and protection of sacred sites in town, has been honoured for her contribution to the local arts community. 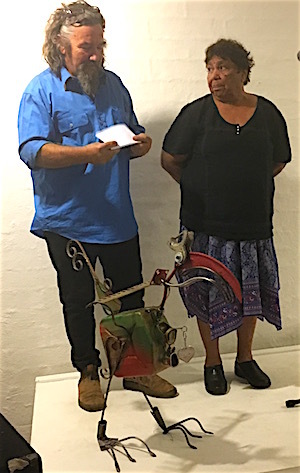 This has been made particularly through the sacred sites tours she has hosted in partnership with Watch This Space (WTS), the now 23-year-old artist-run contemporary art space, which on Saturday night awarded Mrs Stuart the annual Lofty. The award is named in honour of late artist and founding coordinator of WTS, Pamela Lofts. Judges this year were Dan Murphy, artist and chair of the WTS board, Beth Sometimes, artist and board secretary, and myself as an arts writer and former Lofty recipient. Right: Dan Murphy and Doris Stuart on Saturday, with this year’s award trophy sculpted by Mr Murphy. Speaking about the judges’ decision, Mr Murphy recalled Mrs Stuart’s refusal, when he first met her, to do “Welcome to Country” of the formulaic kind. “That’s true and we need to hear that,” Mr Murphy responded, because contemporary art is “art at the edge”, including at the edge of understanding, and making contemporary art is about building and sharing new understanding. That first meeting was in 2008, when Alice Springs hosted the national Regional Arts Conference. 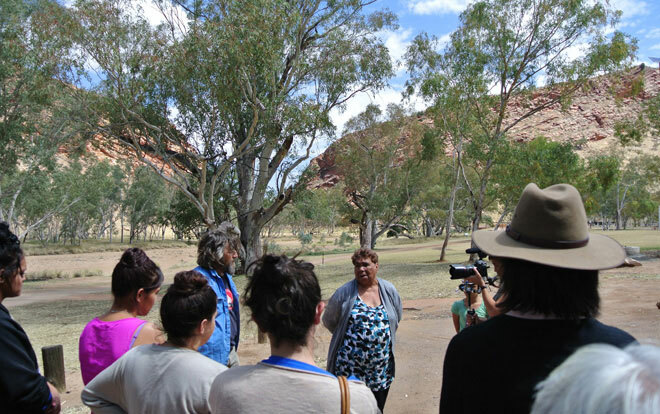 From there, the relationship grew, with Mr Murphy and Lucy Stewart, another WTS artist and longtime board member, supporting Mrs Stuart to offer sacred sites tours, as the occasion arose, to small groups of artists. Many artists, both local and visiting, seek a connection through their art to the Central Australian landscape and the tours help them understand the ways in which it is not only a spectacularly beautiful natural environment but a “cultural landscape too”, said Mr Murphy. Among the many fruits of the collaboration was the 2010 exhibition at the Araluen Arts Centre co-presented by WTS, titled Pmere Arntarntareme / Watching This Place. It showed work by a number of artists that grew out of this kind of informed response to the Arrernte landscape “we all call home”, as Mrs Stuart said at that time. It was also the only occasion, to my knowledge, that several paintings by her son, the late David Mpetyane, have been exhibited together locally, allowing an appreciation of his achievement as an artist. Mrs Stuart remembered him when she responded on Saturday to receiving her award: “I’m not an artist,” she said, “my late son was the artist in the family … I draw my strength from what my son did in his young life. Left: Mrs Stuart during this year’s presentation of the Wild Dog Story at NAIDOC celebrations. “I do my job which is protecting sites and speaking, trying to get understanding between us all that sites do mean a lot to us who belong to the country. It’s our job, you don’t put your hand up for it, it’s just something you have with you all your life, and you’ve got to pass that on to the next generation. “It’s very hard when people think their lifestyle living in this town comes first, but we’ve got ancient law here that’s been around for a very long time. It’s not just here today and gone tomorrow, it’s here for the rest of our lives. This is the kind of ‘welcome’ which Mrs Stuart will enter into – an “ongoing relationship”, measured and strategic, as Mr Murphy said. It allows “a way of thinking that is more enduring that something born out of identity”, as Ms Sometimes said. Previous Lofty recipients have been: Franca Barraclough, David Nixon, Kieran Finnane, J9 Stanton (who is currently showing new work, Feminising the Power Tool, at Watch This Space), and Melissa Kerl. How fantastic! Doris is a perfect choice for this award. Thanks to WTS. Doris is an inspiration to all artists. Just want to say, being an artist (very) peripherally involved with WTS over the years, but also living and being heavily involved in ARIs and arts organisations in Hobart, Tasmania – I look at the Lofty’s as a really really wonderful example of how an arts community can make a historical through-line in its practice: drawing together disparate arts practices in a very transitory town. Not just the Lofty award, but the choices of winners has really created a much clearer story of contemporary arts in Central Australia for everyone else to see. Such a great initiative, and executed year after year with warmth, wisdom, and a certainty of vision. And a super bravo to Doris! So deserved – many congrats Doris!